Eagerly awaited championship draws have thrown up some mouth watering clashes and none more so than our Senior Hurlers being drawn against nearest neighbors and rivals Newcestown. Our Premier Intermediate Footballers will be meeting Eire Og. Cloughduv on Friday was the venue for this entertaining and evenly matched Minor Hurling championship semi-final. The game was played on a fine summer’s evening, with the reward for the winners being the right to play already qualified Newcestown in the final. Bandon were very dominant playing with the wind in the first half and led at half-time by 0.09 to 0.04, though one felt on chances created and not converted, they should probably have been further ahead. The features of the first half were full-back Ben Donegan’s dominance in something of a war of attrition with his direct opponent, and the ability of ace forward Eolann McSweeney to pick off points. Unfortunately he picked up an injury mid way through the half that eventually required him being substituted. The full-forward proved to be a huge loss in the second half as wind assisted Aghabullogue came storming into the game. 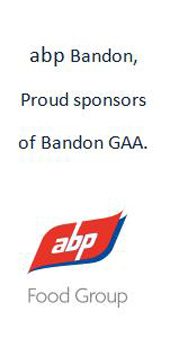 Bandon weren’t helped by the concession of a soft goal that should have been comfortably dealt with. Worse still all this was happening when the pressure on bandon was at it’s greatest. Their opponents were to take the lead and were finding their scores easier to come by. However up stepped Tim Twohig to kick a brave goal in a crowded goalmouth having just been switched to centre-forward. This score re-ignited Bandon’s challenge and steered them back on course. Ben Donegan never put a foot wrong and was the game’s dominant player, but two younger players really stood out on the night, wing back Cathal Lynch who had a great hours hurling and mid-fielder Paul Hartnett who chipped in with some vital scores. Best of the rest were Cian Farrell, Tim Twohig, Niall Daly, Gavin O’ Brien, Tony Quinn, Brian O’ Mahony, also the ever improving and deadly accurate Charlie Long.